The title of this commentary from Der Spiegel newsmagazine about a significant weakening of Germany’s federal environmental protection laws is a pun that loosely translates as Environmental Destruction Agency. 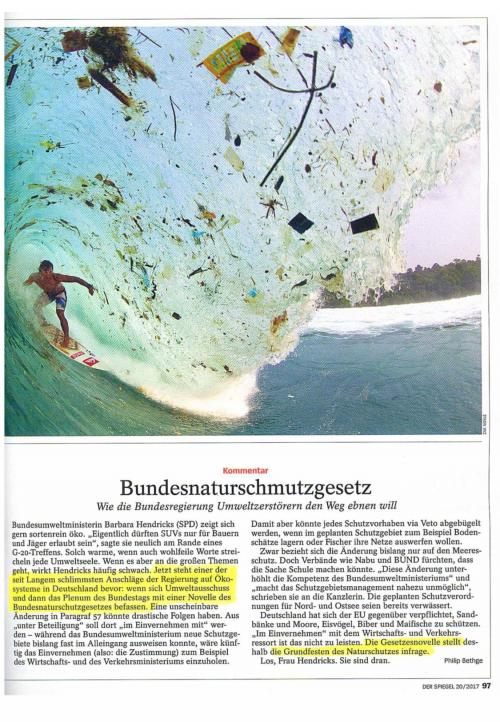 This is the only time I’ve ever translated an existing piece here and do so because the issue is important, timely, is representative – broadly speaking – of Germany’s environmental stance, and I don’t have the background knowledge in German environmental policy to conduct a thorough analysis. The government wants to smooth the way for environmental degradation. Minister of the Environment Barbara Hendricks (SPD) [mainstream center-left party] likes to appear certified organic. “Only farmers and hunters should be allowed to own SUVs”, she recently said on the sidelines of a G-20 meeting. Warm and fuzzy words like these touch every environmentalist soul. But when it comes to the big issues, Hendricks often comes off weak. Now one of the worst legislative attacks on Germany’s ecosystems in a long time is imminent as the Environment Committee and then the Parliament take up an amendment to the federal environmental protection laws. An inconspicuous change in Paragraph 57 could have drastic consequences. The phrase “with the involvement of” is to be replaced by “in agreement with”: where the Environment Ministry until now could designate new environmental protection areas nearly on its own, in the future it will have to do so with the “agreement” (in other words, consent) of, for example, the Ministries of Commerce and Transportation. Thus any protection measure could be stonewalled by veto, if, for example, the area in question has economically valuable natural resources, or could serve as fisheries. For now, the amendment only covers marine protected areas. But organizations such as NABU and BUND [counterparts of the Sierra Club or Natural Resources Defense Council] fear it could establish a precedent. “The amendment undermines the authority of the Environment Ministry” and renders “protected areas management virtually impossible,” they wrote to Chancellor Merkel. The currently planned regulations for the North and Baltic Seas have already been watered down. The EU, however, has obliged Germany to protect sand bars and peatlands, kingfishers, beavers and shad. This cannot be achieved “in agreement” with Ministries of Commerce and Transportation. The amendment calls into question the very foundation of environmental protection.